The initial idea for this project came to me when I came across a life cast of Bill Murray from the motion picture "Scrooged" (1988). This is prefect timing because his facial structure from this movie was in between Ghost Busters (1984) and Ghost Buster 2 (1989). In order to make this into a life size stand-up I would need to make it into a full head with the eyes open. A mold would need to be made so I could brush in liquid clay. 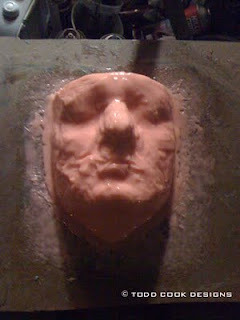 Once the clay hardened I could then sculpt the eyes open and add the sides and back of the head. First step in molding Mr. Murray's face was choosing which material I wanted to mold it out of. 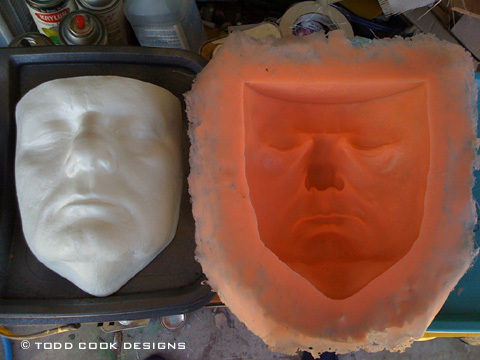 Since the original piece is a hard urethane plastic I decided to make the mold out of Smooth-On Rebound 25. Rebound 25 is a thicker platinum silicone that can be brushed on in layers to make a nice durable mold. Once the Rebound 25 has cured for 16 hours I then made a shell that would cover the whole silicone area to allow the mold to keep its shape once the original piece is removed from the mold. 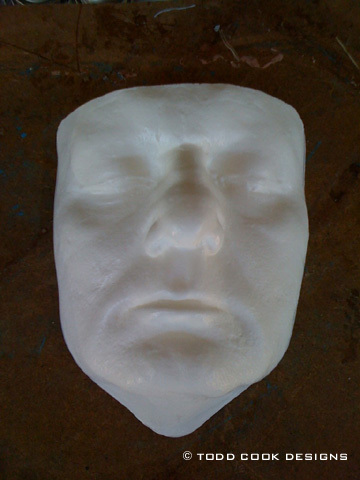 This was made by mixing automotive body filler with fiberglass resin to produce a more "liquid" filler that could be brushed on to the silicone mold. 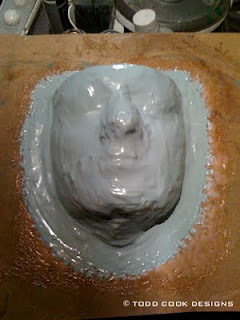 Once that has hardened up I would then cover the filler with fiberglass cloth and resin to ensure a strong shell. Once everything has cured over night it was ready to de-mold. Once the original piece is removed I then trimmed up any rough edges. Now I have a perfect mold to brush in the clay so that I can make all the need changes.